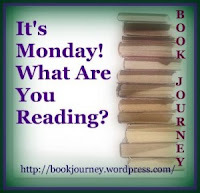 Coffee and a Book Chick: Monday, Monday... What Are You Reading? Monday, Monday... What Are You Reading? First, THANK YOU to Sheila at Book Journey! I won her anniversary giveaway and woke up this morning to find a $20 Amazon gift card in my email! *dance* Woot!! 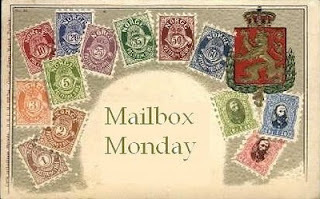 Thanks to Library of Clean Reads for Mailbox Monday and Sheila at Book Journey for It's Monday! What Are You Reading? 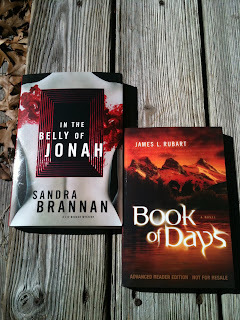 In the Belly of Jonah, by Sandra Brannan - This has been so well received and I'm excited to get a chance to read it. And this one is autographed! *squeals* Here's the first couple paragraphs: "A window cut into a girl's body sets off a desperate search for a serial killer with an artistic bent. Liv "Boots" Bergen is shocked when the body of a stunning college intern working in her Colorado limestone quarry is found on the shores of a nearby reservoir. Clues are scarce - except that the crime scene appears to be a macabre, intricately staged tableau." 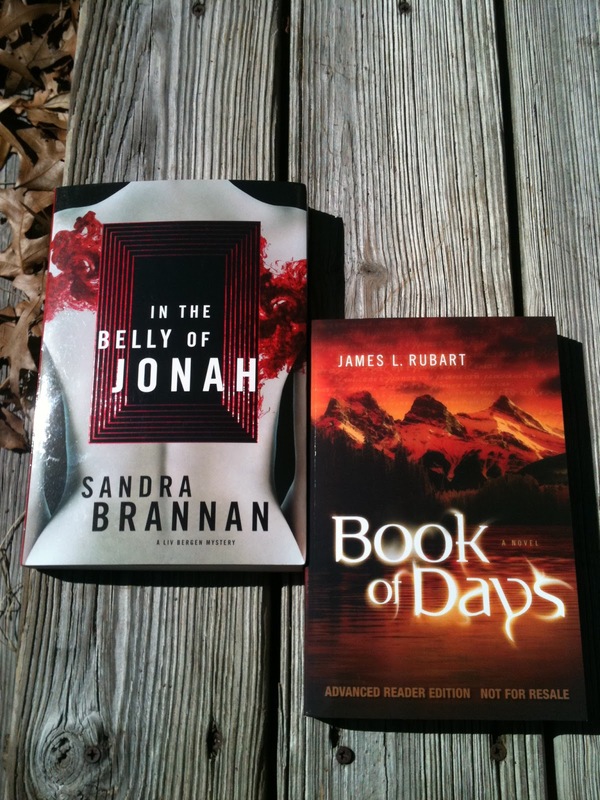 Book of Days, by James L. Rubart - Although something I don't normally pick up, it's a Christian fiction book that definitely hooked me. Doesn't this sound different? "Young Cameron Vaux's mind is slipping. Memories of his wife, killed two years earlier in a car accident, are vanishing just as his dad predicted they would. Memories he knows he has to remember. His father tells Cameron that to save his mind he must find 'the book with all days in it' - the past and future record of every dole on earth." Something about it just drew me in. Thanks to Marissa at JKS Communications! The books sound good, especially In The Belly of Jonah. Congrats on the win!!! The Belly of Jonah sounds good to me too!! Congrats on your win! Enjoy your book!! Oh my gosh, I've heard such great things about In the Belly of Jonah! I can't wait to see what you think of it! Both the books sound great. Happy reading and spending! Oooh, Belly of Jonah requires a review soon! I look forward to it. Congratulations on your win! How fun!!! I too have In the Belly of Jonah to read...and want to get to it asap cause it sounds so incredibly good! Looking forward to your review! Congrats on your win! Your new books look really interesting - I hope you enjoy them both! Book of Days looks really interesting. Enjoy both and congrats on the winning! The cover of the Belly of Jonah is wild...looks like great reads! Congrats on the win! I believe I was supposed to get Book of Days through Library Things Early Reviewers, but haven't seen it yet. Both titles look great! Enjoy the reads! Congratulations on the win! How awesome! YAY for winning :) I have The Belly Of Jonah, since last May and have yet to read it - I need to do that soon it sounds so awesome! Always nice to get an autographed book. And congrats on the win. The Book of Jonah looks like a really great read, and I will be looking forward to your review of it. I am reading Housekeeping my Marilynne Robinson at the moment for book club, and am having quite a time with it. It's a bit of a struggle at this point. Cool! Congrats on your winnings and enjoy your books! I won a review copy of Book of Days from Library Thing's Early Reviewers program (it's not here yet), and I also have an eGalley of his "Rooms" title .. they both seem like reads I would enjoy! In the Belly of Jonah is also one that I've had my eye on! Enjoy the reads!